Filby Broad at Filby LakeFilby Broad is part of the self-contained Trinity Broads network in the Borough of Great Yarmouth. The area was designated a Site of Special Scientific Interest (SSSI) in 1998 and is now a part of the Broads Special Area of Conservation (SAC). The nearby village of Filby has a pub, restaurant and shops. A small car park on the outskirts of the village marks the start of a boardwalk, suitable for wheelchairs and pushchairs. A fishing platform is also available, and is suitable for wheelchair users. 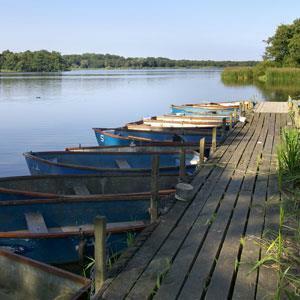 Two person rowing boats suitable for fishing only are available to hire from the Filby Bridge restaurant.